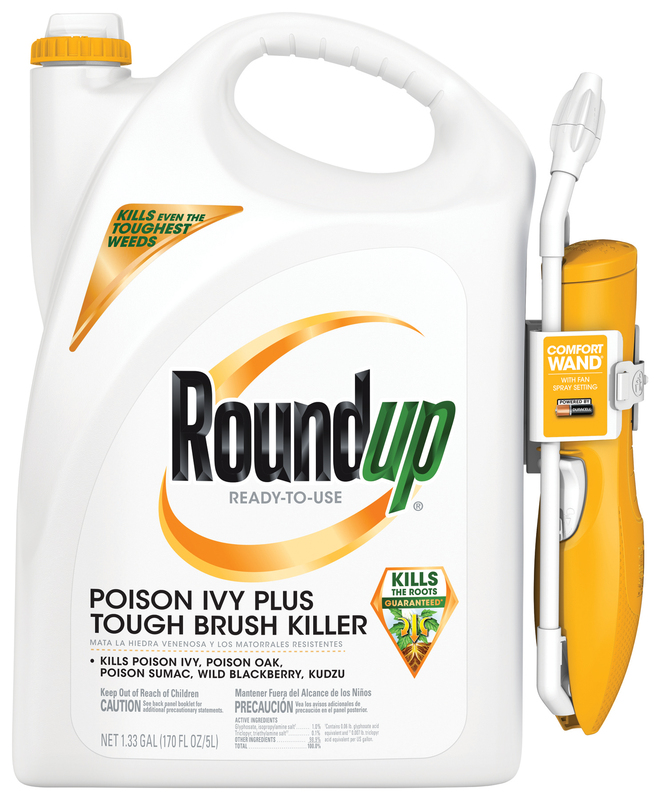 Kills many types of tough weeds: poison ivy, poison oak, poison sumac, blackberries, kudzu, honeysuckle, ragweed, and other tough to control brush. Rain proof in as fast as 30 minutes. The ready-to-use formula features a continuous spray wand that is easy-to-use. Use on wooded lots and other areas where tough weeds are invading your yard. In recreational areas, fields & trails; around buildings, cabins, lodges, & camp sites; on wooded or vacant lots. For more information on what products to use and where, click here. Spray the weeds or brush you want to kill until thoroughly wet. If vines are growing up poles, fences or tree trunks with mature bark cut vines to a height of 3 to 4 feet and spray vines thoroughly. If vines are climbing shrubs, or immature tree trunks with green bark, cut vines at base and spray regrowth. If spraying regrowth, shield shrubs and immature tree trunks from spray drift with a piece of cardboard or plastic. Do not use on or around edible food or feed crops; or where livestock grazing is allowed. Do not use for lawn renovation or vegetable garden preparation. Apply when weeds are actively growing. Be sure to spray when the air is calm to prevent drift to desirable plants. For best results, apply during warm, sunny weather above 60° F.
Whenever weeds are actively growing. If vines or tough brush are not completely killed within 4 weeks, repeat application. Some established hard to kill weeds may require a repeat application. Brush sprayed in the fall may not be controlled until the following season. In the spring, spray regrowth if it occurs. Do not apply directly to water. Triclopyr demonstrates the properties and characteristics associated with chemicals detected in groundwater. The use of this product in areas where soil is permeable, particularly where the water table is shallow, may result in groundwater contamination. IF EMPTY: Place in the trash or offer for recycling if recycling is available. IF PARTLY FILLED: Call your local solid waste agency for disposal instructions. Never place unused product down any indoor or outdoor drain. People and pets must not touch treated plants or enter treated areas until after spray has dried. IMPORTANT: Do not spray plants or grasses you like – they will die. Not recommended for spot weed control in lawns since this product kills lawn grasses. When spot treating weeds around desirable plants, shield plants from drift with a sheet of cardboard or plastic. If desirable plants are accidentally sprayed, rinse off immediately with water.